Gwyn McCormack from Positive Eye shares simple activities you can do using everyday items to help children with vision impairment (VI) develop an understanding of objects, numbers and letters. Learning objectives: To support understanding the qualities of objects. Ideas: Collect items from around the house and explore the qualities and characteristics of each object thoroughly with the child. For example, explore the “woodeness” of the wooden spoon – how it’s made, where it’s kept, what it’s used for, where it’s bought from; make sounds with it; explore the textures and feel of the object, smell it, taste it, feel it, look at it! Experience and maximise the learning opportunities by organising items from shortest to longest, thinnest to widest, or smallest head to biggest; or measure using the spoon as a unit of measurement. Variations: Have fun exploring whisks, objects that roll, drinking vessels such as cups (paper, plastic, metal, thermos, china), objects that can be used to store other objects (vary shape and/or size), or use objects from around the house and the garden. Learning objectives: To develop counting, matching and sorting, categorising and discriminating skills. 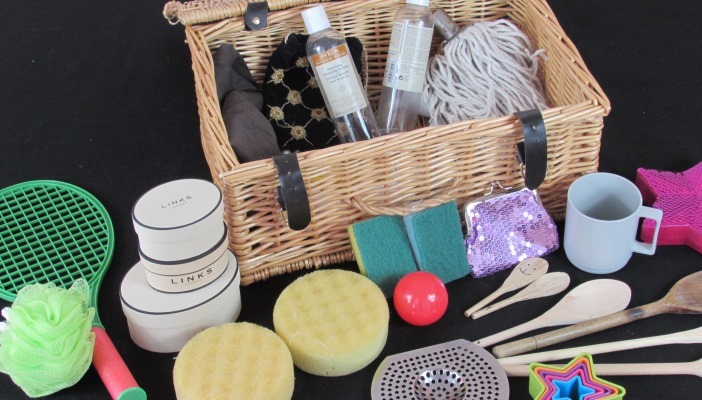 Ideas: Using different textures, make sounds, play and extend the learning – rattle the spoon in the cup, fill the cup and the jug with water and find out which holds the most, squeeze water from the sponges, match the socks or categorise the brushes, such as toothbrushes and paintbrushes. Variations: Children with VI need lots of reinforcement and a wide range of experiences to support concept development. Change the objects in the basket, use objects beginning with the same letter, texture or sound, or use natural objects from outside and man-made objects. Learning objectives: To sort and match objects by the material made of by their texture. Ideas: The concept hanger makes a great base to hang on your wall. Items can be secured with pegs, string or cable ties. This will need to be supported by an adult. Change the collection each week and encourage all family members to participate in the activity. Add objects to the hanger and encourage exploration, for example with a range of chunky, bright coloured bracelets made of wood, beads and metal. Variations: Collect wooden spoons, metal objects such as keys and padlocks, cups and mugs, and brushes and sponges. Record a message about the objects saying the name of the object and why each person likes it. This assists the child to link the object with its name. Count the number bracelets and how many fit up the child’s and adult’s arm. Make bracelets with wooden beads. Think about what bracelets are used to signify, for example a baby is given a name bracelet at birth, bracelets are given as gifts to celebrate a special occasion or entry to a festival. Explore jewellery boxes and find all the bracelets. Learning outcomes: To pair same numbers together and support understanding of number bonds up to five. Ideas: Make two sets of matching shapes with five in each set (they can be any shape you like, such as squares, triangles or circles – or even rocket men!). Add a number from one to five to each shape in each set. Place one set of shapes in front of the child and Velcro the other set to the five positions on the Lazy Susan. Roll the dice. When the dice lands on a six, the child can press the buzzer and spin the Lazy Susan. The buzzer makes the activity exciting and provides some feedback when the child is successful in rolling a six. The buzzers are available from the Learning Resources website. When the spinner stops, the child then reads the number on the shape that stops in front of them and finds its matching pair from their set of shapes. Variations: You can support your child’s learning in many ways by using this Lazy Susan as a base, for example change the numbers for initial letter sounds or braille code signs, match braille word sign to its full word, or match textures, shapes or colours. Learning outcomes: To understand the concept of one, two, three, four, five etc. Ideas: Label box lids with the numbers 1, 2, 3 and so on, and provide the child with a box of objects for them to sort and categorise into each number box. For example, place one car in the box with the number one on the lid, place two fans in the box with a number two on the lid, and place three bottles in the box with number three on the lid. Alternatively, you could encourage the child to explore a drawer or cupboard and to find objects to add to the boxes. Variations: You could change the range of objects used; use a theme familiar to the child, for example base the activity on Frozen or Star Wars by adding characters from the films to the box, one character in the number one box, two characters in the number two box etc. Learning outcomes: To match object to the word’s initial letter sound. Ideas: Decorate the bucket with textured, glittery sticky-back shapes, which you can purchase from places like Hobbycraft or Amazon (use peel-off sticky shapes for ease of application). Add everyday objects to the bucket, for example a book, pencil or key ring. Make individual tickets (use sticky labels on blank ID cards), write or type out words on each label and add them to each blank ID card. Add Velcro to the back of each one and put them on the outside of the bucket. To do the activity, the child chooses a ticket from the outside the bucket, reads the word’s initial letter sound, then places their hand in the bucket to find/match the object. The activity is completed when the child has matched all the word tickets to the correct objects. Variations: Use a theme that the child likes, for example cars, animals or shapes. Match textures or match shapes, for example match a 3D shape to its 2D equivalent. Easy classroom adjustments for learners with vision impairment. Top tips for supporting a child who has vision impairment with homework. Bring stories alive for children with vision impairment.